The results of the study, led by researchers from the National Institute for Physiological Sciences in Japan, will be published in an upcoming issue of Nature Communications. For patients with end-stage renal disease, a kidney transplant is the only hope for regaining quality of life. Yet many of these patients will never undergo transplant surgery due to a chronic shortage of donor kidneys. With 95,000 patients on the waiting list for a donor kidney in the United States alone, demand far outstrips supply. But researchers have been working on ways to grow healthy organs outside the human body. One such method, called blastocyst complementation, has already produced promising results. Researchers take blastocysts, the clusters of cells formed several days after egg fertilization, from mutant animals missing specific organs and inject them with stem cells from a normal donor, not necessarily of the same species. The stem cells then differentiate to form the entire missing organ in the resulting animal. The new organ retains the characteristics of the original stem cell donor and, thus, potentially can be used in transplantation therapy. "We previously used blastocyst complementation to generate rat pancreas in pancreatic mutant mice," explained Teppei Goto, Ph.D., lead author of the new study. "We therefore decided to investigate whether the method could be used to generate functional kidneys, which would have much greater application in regenerative medicine owing to the high donor demand." After being implanted into pseudo-pregnant rats, the complemented blastocysts matured into normal fetuses. Remarkably, more than two thirds of the resulting rat neonates contained a pair of kidneys derived from the mouse stem cells. Further screening showed that all of the kidneys were structurally intact, and at least half could potentially produce urine. 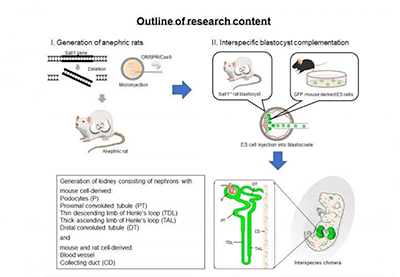 "Our findings confirm that interspecific blastocyst complementation is a viable method for kidney generation," said the study’s corresponding author, Masumi Hirabayashi, Ph.D. "In the future, this approach could be used to generate human stem cell-derived organs in livestock, potentially extending the lifespan and improving the quality of life of millions of people worldwide." A diagram of method and result. Image courtesy of National Institute for Physiological Sciences.